Frozen Grapes — MumbleBee Inc MumbleBee Inc. I heard this is good to put in drinks in the summer. Even wine. Because it keeps them cold without watering them down. I love frozen grapes! My kids do too! Like you said this is a must try! I am making sangria for Easter dinner and you have given me the idea to add frozen grapes to the pitcher to keep it cold and not dilute it. Brilliant!!! I have never thought to do this. Grapes are expensive and not cheap, and my little boys never eat them quick enough before they go bad so from now on I will be doing this. Thanks for sharing this awesome tip. This is great for summer. My g’son just loves grapes. I also like that it’s so simple. We can send these with him to school for his snack. Great pick me up and good for on the go. I think I’m going to pop some in the freezer tonight. This would be great to have on a hot summer morning. Thanks, never knew you could freeze them. MY niece love grapes! I wonder if she will like them frozen>! I’m going to find out soon enough! Thanks for the info! We love grapes a lot in our house . They are nice in drinks in the summer time. I personally a lot of times like to dip my grapes in cool whip. I am going to try this! Thanks for sharing! 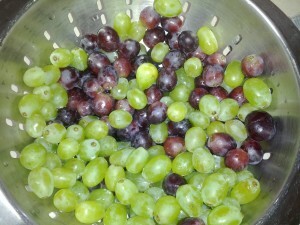 I love frozen grapes….great snack!